Illinois Supreme Justice Thomas L. Kilbride administers the Oath of Professionalism to the NIU Law Class of 2021. The Northern Illinois University College of Law welcomed the Class of 2021 on Thursday, August 16 for orientation. The new class arrived eager to begin their journey towards a legal education. A class composed of diverse ages, races and walks of life, the first-year students are poised to add great distinctiveness to the NIU Law student body. Illinois Supreme Court Justice Thomas L. Kilbride addressed the students on the principles of ethical conduct, leadership and service embodied by the legal profession as well as their importance to society as future lawyers. 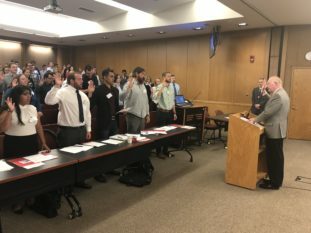 He then administered the “Oath of Professionalism,” in which the students committed themselves to upholding the highest standards and ideals of the legal profession. Students then took part in breakout sessions, facilitated by attorneys and judges, discussing how best to handle hypothetical situations that presented a number of difficult professionalism issues. This exercise was sponsored by the Illinois Supreme Court Commission on Professionalism. During the course of a very busy two days, the new students were addressed by Interim Dean Mark Cordes, met the faculty and staff, and received a wealth of important information and tools to aid in their success. Students also took part in a mock class and practice exam, financial planning workshop, and networking opportunities including a welcome reception hosted by the NIU Law Alumni Office.